Regular followers of WikiLeaks-related news are at this point familiar with the multiple serious infractions of journalistic ethics by Luke Harding and the Guardian, especially (though not exclusively) when it comes to Julian Assange and WikiLeaks. However, another individual at the heart of this matter is far less familiar to the public. That man is Fernando Villavicencio, a prominent Ecuadorian political activist and journalist, director of the USAID-funded NGO Fundamedios and editor of online publication FocusEcuador. Most readers are also aware of the Guardian's recent publication of claims that Julian Assange met with former Trump campaign manager Paul Manafort on three occasions. This has now been definitively debunked by Fidel Narvaez, the former Consul at Ecuador's London embassy between 2010 and 2018, who says Paul Manafort has never visited the embassy during the time he was in charge there. But this was hardly the first time the outlet published a dishonest smear authored by Luke Harding against Assange. The paper is also no stranger to publishing stories based on fabricated documents. In May, Disobedient Media reported on the Guardian's hatchet-job relating to 'Operation Hotel,' or rather, the normal security operations of the embassy under former Ecuadorian President Rafael Correa. That hit-piece, co-authored by Harding and Dan Collyns, asserted among other things that (according to an anonymous source) Assange hacked the embassy's security system. The allegation was promptly refuted by Correa as "absurd" in an interview with The Intercept, and also by WikiLeaks as an "anonymous libel" with which the Guardian had "gone too far this time. We're suing." A shared element of The Guardian’s ‘Operation Hotel’ fabrications and the latest libel attempting to link Julian Assange to Paul Manafort is none other than Fernando Villavicencio of FocusEcuador. In 2014 Villavicencio was caught passing a forged document to the Guardian, which published it without verifying it. When the forgery was revealed, the Guardian hurriedly took the document down but then tried to cover up that it had been tampered with by Villavicencio when it re-posted it a few days later. How is Villavicencio tied to The Guardian's latest smear of Assange? Intimately, it turns out. "...The information in this post alone should make everyone question why in the world the Guardian would continue to use a source like Villavicencio who is obviously tied to the U.S. government, the CIA, individuals like Thor Halvorssen and Bill Browder, and opponents of both Julian Assange and former President Rafael Correa." As most readers recall, it was Correa who granted Assange asylum in the Ecuadorian Embassy in London. Villavicencio was so vehemently opposed to Rafael Correa's socialist government that during the failed 2010 coup against Correa he falsely accused the President of "crimes against humanity" by ordering police to fire on the crowds (it was actually Correa who was being shot at). Correa sued him for libel, and won, but pardoned Villavicencio for the damages awarded by the court. Assange legal analyst Hanna Jonasson recently made the link between the Ecuadorian forger Villavicencio and Luke Harding's Guardian stories based on dubious documents explicit. 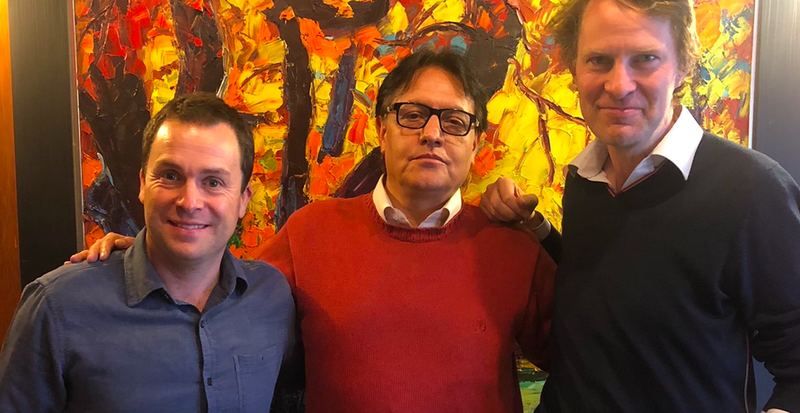 She Tweeted: 2014 Ecuador's Foreign Ministry accused the Guardian of publishing a story based on a document it says was fabricated by Fernando Villavicencio, pictured below with the authors of the fake Manafort-Assange 'secret meeting' story, Harding and Collyns." "There is also evidence that the author of this falsified document is Fernando Villavicencio, a convicted slanderer and opponent of Ecuador’s current government. This can be seen from the file properties of the document that the Guardian had originally posted (but which it has since taken down and replaced with a version with this evidence removed)." The statement also notes that Villavicencio had fled the country after his conviction for libeling Correa during the 2010 coup and was at that time living as a fugitive in the United States. It is incredibly significant, as Jonasson argues, that the authors of the Guardian's latest libelous article were photographed with Villavicencio in Ecuador shortly before publication of the Guardian's claim that Assange had conducted meetings with Manafort. Jonasson's Twitter thread also states: "This video from the news wire Andes alleges that Villavicencio's name appeared in the metadata of the document originally uploaded alongside The Guardian's story." The 2014 Guardian piece, which aimed a falsified shot at then-President Rafael Correa, would not be the last time Villavicencio's name would appear on a controversial Guardian story before being scrubbed from existence. The tweet suggests, but does not specifically state, that Villavicencio worked with the disastrous duo on the Assange-Manafort piece. Given the history and associations of all involved, this statement alone should cause extreme skepticism in any unsubstantiated claims, or 'anonymously sourced' claims, the Guardian makes concerning Julian Assange and Ecuador. Astoundingly, and counter to Villavicencio's uncharacteristic coyness, a recent video posted by WikiLeaks via Twitter does show that Villavicencio was originally listed as a co-author of the Guardian's Manafort-Assange allegations, before his name was edited out of the online article. The original version can be viewed, however, thanks to archive services. The two photographs of Villavicencio with Harding and Collyns as well as the evidence showing he co-authored the piece doesn't just capture a trio of terrible journalists, it documents the involvement of multiple actors associated with intelligence agencies and fabricated stories. All of this provoke the question: did Villavicencio provide more bogus documents to Harding and Collyns - Harding said he'd seen a document, though he didn't publish one (or even quote from it) so readers might judge its veracity for themselves - or perhaps these three invented the accusations out of whole-cloth? Either way, to quote WikiLeaks, the Guardian has "gone too far this time" and its already-tattered reputation is in total shambles. Craig Murray calls Harding an "MI6 tool", but to this writer, Harding seems worse than an MI6 stooge: He's a wannabe-spook, hanging from the coat-tails of anonymous intelligence officers and publishing their drivel as fact without so much as a skeptical blink. His lack of self-awareness and conflation of anecdote with evidence sets him apart as either one of the most blatant, fumbling propagandists of our era, or the most hapless hack journalist to stain the pages of printed news. To provide important context on Harding’s previous journalistic irresponsibility, we again recall that he co-authored the infamous book containing the encryption password of the entire Cablegate archive, leading to a leak of the unredacted State Department Cables across the internet. Although the guilty Guardian journalists tried to blame Assange for the debacle, it was they themselves who ended up on the receiving end of some well-deserved scorn. In addition to continuing the Guardian's and Villavicencio's vendetta against Assange and WikiLeaks, it is clearly in Harding's financial interests to conflate the pending prosecution of Assange with Russiagate. As this writer previously noted, Harding penned a book on the subject, titled: "Collusion: Secret Meetings, Dirty Money, and How Russia Helped Donald Trump Win." Tying Assange to Russiagate is good for business, as it stokes public interest in the self-evidently faulty narrative his book supports. Even more concerning is the claim amongst publishing circles, fueled by recent events, that Harding may be writing another book on Assange, with publication presumably timed for his pending arrest and extradition and designed to cash in on the trial. If that is in fact the case, the specter arises that Harding is working to push for Assange's arrest, not just on behalf of US, UK or Ecuadorian intelligence interests, but also to increase his own book sales. That Harding and Collyns worked intensively with Villavicencio for "months" on the "Assange story," the fact that Villavicencio was initially listed as a co-author on the original version of the Guardian's article, and the recent denial by Fidel Narvaez, raises the likelihood that Harding and the Guardian were not simply the victims of bad sources who duped them, as claimed by some. It indicates that the fake story was constructed deliberately on behalf of the very same intelligence establishment that the Guardian is nowadays only too happy to take the knee for. In summary, one of the most visible establishment media outlets published a fake story on its front page, in an attempt to manufacture a crucial cross-over between the pending prosecution of Assange and the Russiagate saga. This represents the latest example in an onslaught of fake news directed at Julian Assange and WikiLeaks ever since they published the largest CIA leak in history in the form of Vault 7, an onslaught which appears to be building in both intensity and absurdity as time goes on. The Guardian has destroyed its reputation, and in the process, revealed the desperation of the establishment when it comes to Assange.